PHILA, PA -- On a beautiful Sunday evening in late July, the clock struck zero on the last game of the 2018 Philadelphia Phoenix season. The finale was anything but usual for the Phoenix and their fans; earlier thunderstorms had delayed the game’s start time by 3 hours, and saturation of their home field led to a rushed meeting of East Division opponents at a site neighboring their home stadium in Conshohocken, PA. Despite the unexpected time and location, fans still gathered to cheer their hometown favorites, lining the grassy banks of the synthetic soccer turf to witness the final flight of the Phoenix in 2018. The bizarre nature of the evening continued as the Phoenix dropped only their 2nd home game of the season, falling to the surging Empire. Despite their uncharacteristic finish, this year’s Phoenix team notched some fantastic achievements both on and off the field. With the 2018 Phoenix season complete, we take a look back at some of those accomplishments and what they mean for the team and its future. You could not blame a Phoenix fan for having some rostering concerns in the months leading up to 2018’s opening pull. Departures of several top producers, including Head Coach Eileen Murray and standout player Marques Brownlee for the New York Empire, must have left fans wondering how the Phoenix would build on their successes in 2017. The Phoenix responded with an influx of talented players familiar to the local scene. No doubt many of the Phoenix’s new arrivals were attracted by the news that Trey Katzenbach would be taking the helm as player-coach, assisted by Nate Venditta and David Hampson. 27 of the 36 players who would see the field in 2018 were current or former players on local Philadelphia Open Program club teams (compared to 10/32 last year). This year the Phoenix were embraced by Philly’s top talent like never before, opening the door for local heros to make noise on the AUDL field. Ethan Peck, Himalaya Mehta and Mike Arcata logged team-leading stats for the Phoenix offense, while the defensive side of the disc saw impressive contributions from a host of athletic defenders, lead by Matt Esser, Eric Nardelli, Nick Patel and the high-flying Greg Martin. An unforgettable performance was also offered by team MVP Sean Mott, who lead the Phoenix by strong margins in Goals, Assists and Plus/Minus categories. 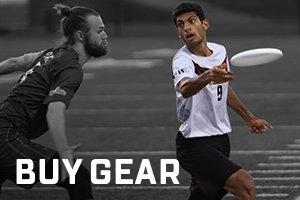 Mott is known for his impressive vertical ability, blinding speed and deft control of the disc. He finished 9th overall in the league-wide goals category, and deservedly attracted much attention in the conversation surrounding league MVP. Commentator Evan Lepler must have had the Phoenix in mind when he dubbed 2018 “The Year of Parity” in the AUDL. From the opening gate, Philly’s roster of fresh faces proved they would not be a team to sleep on in 2018. A one-point loss in their home opener to the 2017 divisional champion Toronto Rush put the East Division on notice, and the Phoenix continued to push expectations through the course of their 14-game campaign. A 3-0 sweep of the Montreal Royal, their first ever cross-divisional victory over rival Pittsburgh Thunderbirds, and a winning home record were just a few among a host of accomplishments Philly managed to notch along the way. In a word, the play by this year’s Phoenix could be described as “refined”. Under leadership from Coach K, the team showed more patience and resilience, allowing 21 less breaks than in 2017 and closing their overall scoring deficit to opponents by 40%. Their development of more consistent play lead to a crumbling of the East division hierarchy, replacing what was once a predictable field with a week-to-week shuffling as rivals grappled for dominance in the standings. 2018 proved to be a statement year for the Phoenix. 5-8-1 on the season, 1.5 games back from playoffs, this was their most successful season since the 2014 expansion of the East Division. Philadelphia showed us they can go toe-to-toe with any competitor in the league, and judging by the new coaching staff and roster, we have yet to see the peak of what the team and its program can accomplish. If they continue to ride their current upswing through the offseason, the sky seems the limit for the rising Phoenix. For the 2018 Philadelphia Phoenix Top Ten Skies and other season highlights, subscribe to the official Philadelphia Phoenix Youtube Channel.